Imagine 22,000 of your favourite football grounds (Stamford Bridge or Lang Park, for example) all in a line. That’s around the amount of land – 16,000 hectares – affected by the bushfires that ravaged North Stradbroke island in Australia for two weeks over the 2014 New Year period. Courageous emergency services staff and volunteers worked long shifts in challenging conditions to make sure that no lives or homes were lost. Communicating with the public was a big challenge. North Stradbroke, or Straddie, as it’s known, is accessible from the mainland only by water taxi and vehicle ferry. A large number of tourists were on the island, many of them camping in remote beach areas. Vital infrastructure was destroyed resulting not only in power outages, but smoke that blanketed Straddie, neighbouring islands and the mainland for days. Despite these challenges, our communications throughout the bushfires received widespread praise. A Queensland Fire and Emergency Services (QFES) superintendent described it as outstanding. The best-known radio presenter in Brisbane ABC’s Spencer Howson gave us 10 out of 10 for our live tweeting and other updates, and dozens of messages from the public thanked us for keeping them informed. Why was the council so successful? Our team worked alongside emergency services and volunteers at the Disaster Resilience Centre on North Stradbroke Island. This gave us important insights into how operations were being run and allowed us to get approval for updates quickly. This was a great way for us to answer questions from the public about power outages, smoke hazards, road closures, ferry services and evacuations. The council also summarised and disseminated updates from other agencies, making ourselves the go-to source of information for the community. Facebook is invaluable in emergencies. Our posts were shared hundreds of times and our reach hit more than 1 million people in 10 days. Our Twitter reach topped 1.1m with retweets from the public, media and emergency services. Social media also gave us situational awareness in remote communities during the bushfires. Reports of ember strikes and spot fires on the Southern Moreton Bay Islands were relayed to emergency services who sent crews to those locations. With power outages and other logistical issues, it was vital that traditional and digital communications were tightly integrated. As well as round-the-clock updates on social media, our team organised 11 bushfire community information sessions over two weeks to keep residents informed with the latest information and to provide a forum for questions. More than 2,000 people attended. The mix of traditional and digital comms worked well: updates, questions and answers were live tweeted and live blogged on our news site with summaries posted on Facebook. We published rolling coverage of events throughout the bushfires on ourWordPress news site. The coverage mixed live blogs in with crowdsourced photos, embedded tweets, links to media releases, live streamed videos, sound clips and “hero shots” of emergency services personnel and volunteers. Our news site uses a responsive design so content can be read easily on different devices. This is crucial for disaster management communications: of the 10,000 visits to the site in the first 10 days of the bushfires, 40% were from smartphones and 20% were from tablets. In 2013 I set up a Bambuser account after seeing how the West Midlands Fire Service used live streamed videos. Immediately after the community information sessions, we brought it into action, live streaming interviews with emergency services personnel and council representatives. Embedded on our news site, the videos received more than 3,000 views. Bambuser also provided a platform for others to tell their story: we live streamed interviews with the chief executive of the Quandamooka Yoolooburrabee Aboriginal Corporation describing how the fires affected the traditional owners of North Stradbroke, as well as a council conservation officer, who explained how wildlife was coping. When we couldn’t be in the same location as emergency services staff, technology played an important role. One afternoon I recorded an update with a public information officer using two iPhones and uploaded it to SoundCloud. Within a few hours it received more than 400 listens and was used by local radio. It was also transcribed by QFES staff in Brisbane, who published it as a bulletin on their website. The work showed what can be achieved with the right mix of technology and teamwork. 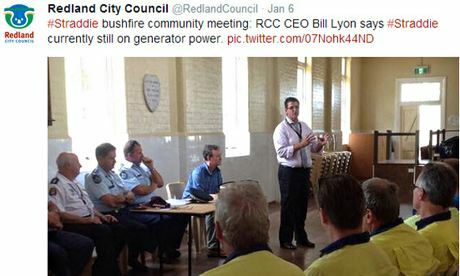 How one council battled Australian bushfires using social media was first published by The Guardian on 7 May 2014. 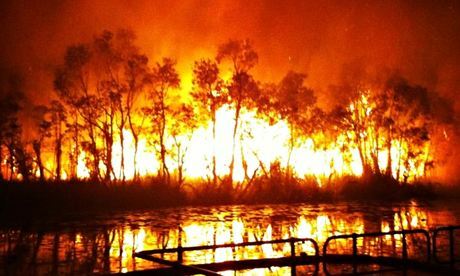 Picture credits: Redland City Council Fire Management Team by Matt Murray, Heron Lagoon by Redland City Council Fire Management Team, Dunwich public meeting by Matt Murray.